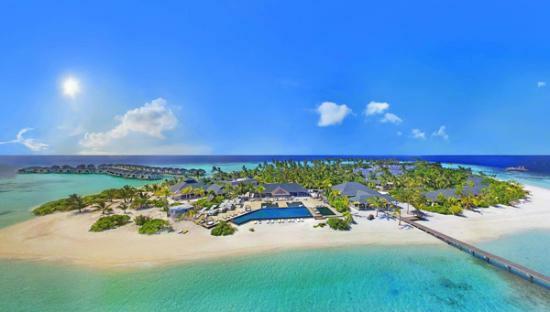 Along the Gaafu Dhaalu Atoll, this luxe resort on a sandy island beach is accessible by a 10-minute boat ride from Kaadedhdhoo Airport. Chic beach and overwater villas feature free Wi-Fi, flat-screens, minibars, and tea and coffeemakers, plus terraces and open-air bathrooms. Upgraded villas add plunge pools. Room service is offered. Meals, drinks (limited) and loaner snorkeling gear are complimentary. Other amenities include 3 restaurants, 2 bars and a spa, as well as sports courts, and an outdoor pool with a kids’ area. Boat excursions and scuba diving are available. A health clinic is on-site. Kids age 7 and over are welcome in select villas.